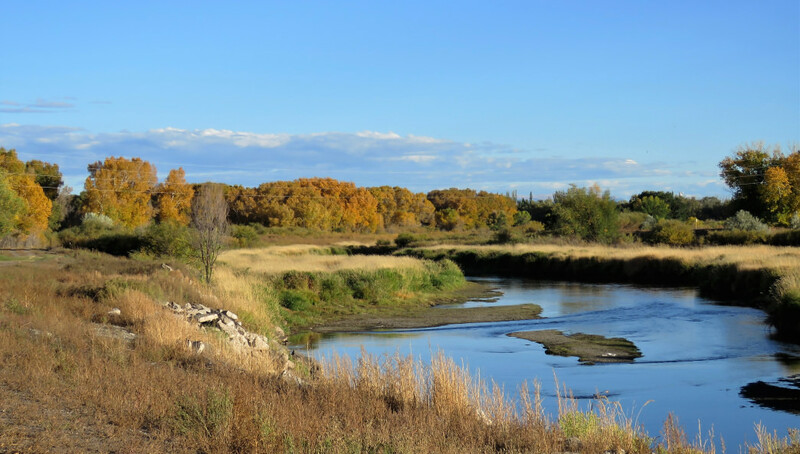 Heaven among anglers, the high-desert valley of Alamosa is home to a ginormous web of more than 1,400 rivers, streams, reservoirs and lakes, including the beloved Rio Grande River, which is fed by the surrounding snow-capped peaks. Of those waterways, the Rio Grande River, a siren call to anglers, embodies one of the longest stretchs of Gold Medal Water that the Centennial State can offer. To qualify for Gold Medal status, the water must produce a minimum of a dozen quality trout—measuring at least 14 inches—per acre. This healthy ecosystem delivers 60 pounds of standing stock—the amount of living organisms in the ecosystem, including fish, plant life, and micro invertebrates—per acre. The designation only applies to water that is accessible to the public. The Rio Grande and other waterways near Alamosa support five major species of fish, including rainbow trout, brown trout, brook trout, cutthroat trout, and Rio Grande cutthroat. Considering the wilderness of the San Luis Valley, its unique terrain—including the tallest sand dunes in North America—and boundless outdoor recreation access (without big crowds), this area is prime for all varieties of anglers. Diehard explorers can venture to remote, high-alpine lakes, yet families can design fishing vacations that allow access to amenities in town and a fun mix of other outdoor activities. Whether you stay near town or go deep into the Rocky Mountains, you’re bound to catch healthy trout. Here’s your guide to help kickstart a trip to the world-class angling scene that surrounds Alamosa. The headwaters of the Rio Grande River begin in the high-alpine area of the San Juan Mountains, and the river flows to the Gulf of Mexico. Farther south of Alamosa, a 74-mile segment of the Rio Grande is one of the country’s eight original rivers to be protected under the National Wild and Scenic River Act. The designated portion flows through the 800-foot-deep Rio Grande Gorge, which abounds with cutthroat trout, in the Rio Grande del Norte National Monument. WSR protection has allowed the belly of the Rio Grande’s 1,900-mile stretch to remain as wild as it was 50 years ago. West of Del Norte, the Rio Grande River is chock-full of high-quality brown and rainbow trout: yes, the Gold Medal waters. This 17-mile stretch flows from the Colorado State Highway 149 bridge at South Fork downstream to the Rio Grande canal diversion structure. South Fork Campground is one overnight option that’s right on the water. To tailor your trip, check out the map of fishing access sites, according to DIY Fly Fishing. If you enjoy an adventurous route, explore South Zapata Creek, which holds a fair number of 7- to 10-inch brook trout, as well as cutthroat and rainbow. The fish are mainly found near the lakes on the upper end, which are occasionally stocked by air, according to the Alamosa County Colorado Fishing & Floating Guide Book. Start your journey on South Zapata Trail, which winds for 5 miles until it reaches the stunning basin of South Zapata Lake, where you can set up camp for the night. West of Alamosa, this 93-mile tributary of the Rio Grande offers solitude and incredible fly-fishing in the San Juan Mountains. 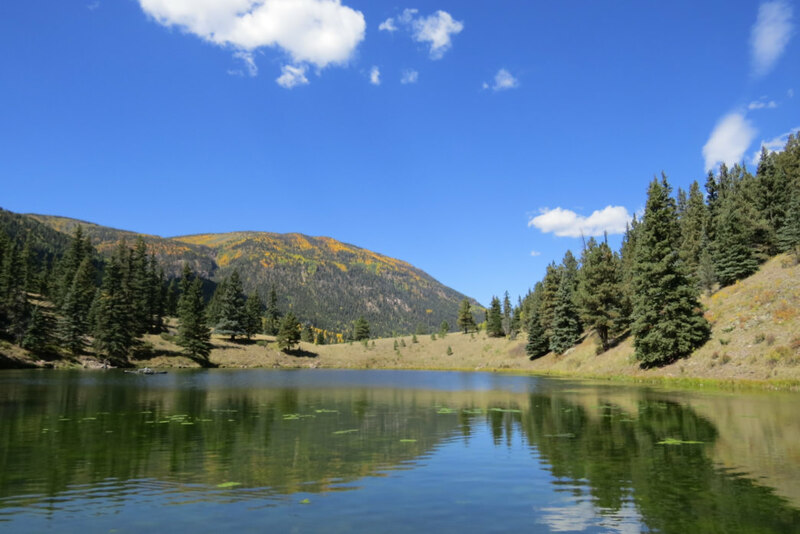 The location is primitive—be prepared with plenty of food and water—but, the trade-off is you’ll enjoy solitude at Conejos Campground and Spectacle Lake in the Rio Grande National Forest. Beyond the lake and river water there are surrounding trails for a hike or casual walk before and after tossing the line. Mountain Home Reservoir is a 715-acre coldwater lake that sits within the boundaries of Mountain Home State Wildlife Area, which is located about 30 miles east of Alamosa. The catch includes rainbow, cutthroat, brook and northern pike. You can spend a night beneath the Milky Way, and then wake to a morning sunrise over the incredible silhouette of the Sangre de Cristo Mountains. Throughout the summer months, the reservoir is stocked with trout and is open to ice fishing all winter. Camping is allowed, and no reservations or fees are required. Given the ease of access, this is a great location for mellow family trips. It’s also a good option if you’re on a road trip and you’re looking for a spot to stretch your legs, camp, and fish for the night. If you’re keen to explore a unique desert ecosystem with an epic backdrop of 14,000-foot peaks, here it is: The heart of the world’s largest inhabited alpine valley, San Luis State Wildlife Area. A former state park, the wildlife area features Mosca Campground (first-come, first-served), which is situated in the low dunes that are west of San Luis Lake, a natural high-altitude oasis that’s home to rainbow trout. The water is the warmest in the San Luis Valley, so swimming, boating, and sailing are pleasant. Birders can catch sight of waterfowl, songbirds, shorebirds, and raptors. You can get your blood pumping before the cast, too, as there are 4 miles of level, gravel trails that weave along the edge of Great Sand Dunes National Park and are open for hiking or mountain biking. Wolf Creek Anglers Fly Shop and Conejos River Anglers offer guided trips. Trout Unlimited has a San Luis Valley Chapter, which offers social gatherings, volunteer opportunities and chapter meetings for members. Colorado Parks and Wildlife is also a tremendous resource for a variety of information, from stocking and fishing reports to upcoming tournaments. Annual fishing licenses are valid from April 1 to March 31, the following year. One-day fishing licenses are also available, and youth under the age of 16 years old can fish for free. Buy a license online. 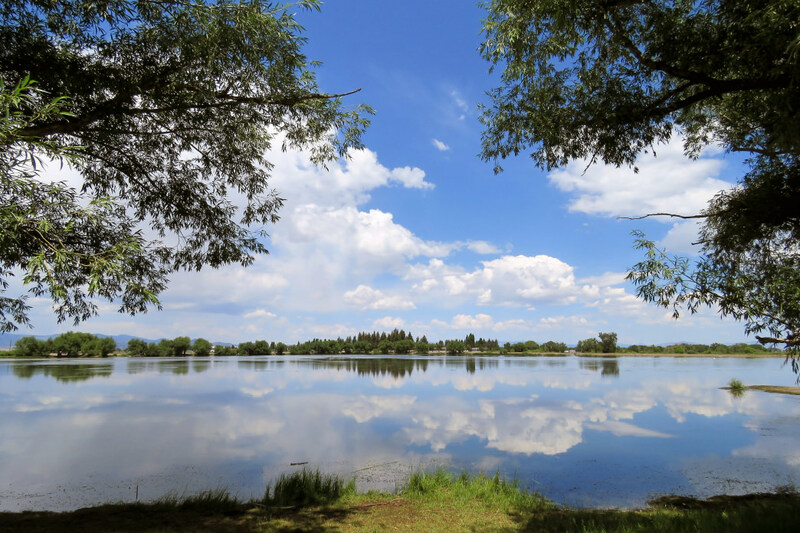 To help protect these waters, several organizations and agencies are based right in Alamosa, including the Rio Grande Headwaters Restoration Project, the San Luis Valley Conservation and Connection Initiative, and the San Luis Valley Ecosystem Council. If you have any questions or concerns about how to help preserve and care for these pristine environments, reach out to those organizations with questions.